Buy the Farm . . . Share: Chi Fan Le Mei You? With so many holidays sandwiched all together in such a short span of time it really takes some planning to get all of them in. Last night Jen prepared herself a traditional Valentine's Day meal, thus ignoring the Chinese New Year. However, since the Chinese New Year is really a week celebration, tonight it was my job to try to encapsulate the new year with an incredibly unstudied collection of dishes that encapsulate the rich tradition of the holiday and (more importantly) require no additional grocery buying. That's a tradition we can all get behind. The second day of the Chinese New Year is called the "Day of Commencement" and it is traditional to prepare a commencement lunch. I tried to take the day off of work explaining to them that it was customary for me to do this as a part of my heritage but, sadly, it was not to be. Traditionally this is a lavish meal to celebrate a prosperous year and is rich with oysters, duck, chicken, carp, and braised seaweed. I scoured the pantry and, unfortunately, did not find any of this. 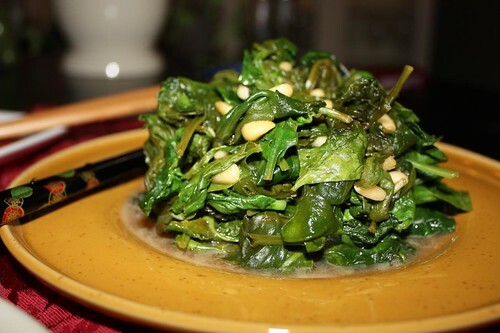 What I did find was a full pound of spinach which I sauteed with some fresh ginger, Mirin, pine nuts, and a little rice wine vinegar. 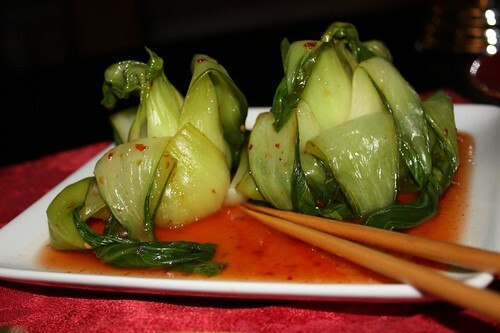 I also quickly boiled some baby bok choy and marinated it (though I suppose that's a stretch of the definition if the marinating time is less than ten minutes) in a little sweet chili sauce. 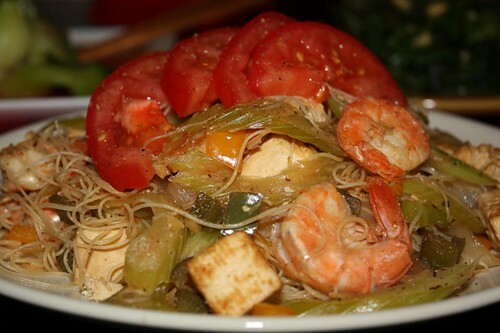 I also made some rice noodles with ginger, miso, teriyaki, celery, peppers, shrimp, tofu, and sliced tomato. This used up a good amount of miscellaneous Asian condiments from the fridge with this dish which made it taste all that more delicious. 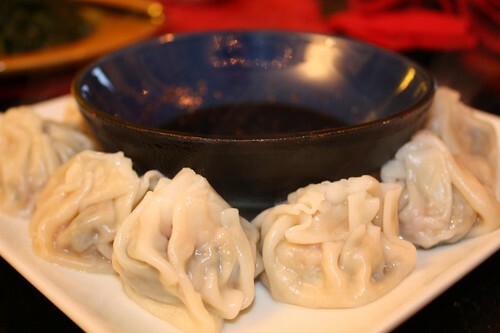 Jen had also made these dumplings and frozen them so I steamed up a small handful with a soy dipping sauce that Jen made. Not exactly traditional but fitting for the late nineties Pan-Asian-Fusion area that we live in. This dinner would have soothed any number of locals into feeling assured that they were, in fact, safe and sound in Westchester County. There are a lot of more traditional things we could have done for dinner but that would have required doing research, buying ingredients, and spending more than a half an hour making dinner! I'm like Rachael Ray, baby. I make 30 minute meals! Tomorrow is the third day of the Chinese New Year. It is known as the "Day of Squabbles." On this day people find it best to stay home and avoid any social interaction. Now that's my kind of holiday! Unfortunately for me tomorrow is also another holiday for us as well. And by holiday I mean: something that doesn't actually mean anything to me other than an excuse to make something specific for dinner. While the food will be all but traditional Chinese we will still celebrate it by staying home and avoiding social interactions so that's a major bonus for me. Man . . . The Day of Squabbles. What a great day!